My wife Adrienne was in need of some design services for a logo and business cards for her consulting services. Happily a friend of mine, Roby Fitzhenry, works for a first-class graphic design studio: Always Creative. The three of us met over beers at Revolution Bar one evening to hash out a deal. He would provide some branding and design services and we would make beer and replace a toilet in the Creative Space where he and I share offices. Roby likes Newcastle Brown so I started looking for recipes for a similar beer. Newcastle Brown is a blend of two beers, a strong “vatted” ale and a weaker beer. The strong beer is matured in maturation tanks for a period of time and this is blended with a weaker and probably younger beer of OG 1030; the final blend having an OG of about 1045. Unique flavor characteristics that are only developed during the maturation of strong beers are then imparted to the strong beer, producing a full flavored beer for its gravity. I will reproduce the single-batch recipe Wheeler and Protz provide, modified to fit ingredients I had on hand, and explain how they suggest splitting the batch. To make strong and week beers to blend, multiply the ingredients by 1.7 and 0.68 respectively. Blend one part strong with two parts weak. It was easiest to scale the recipe to 15 gallons, brewing 5 gallons strong with 10 gallons weak. I only promised 10 gallons to Roby so I get to keep 5 gallons for myself. My brewery lacks a 15 gallon fermenter. A fellow brewer graciously loaned me a carboy so I could ferment the beer in three vessels. Upon kegging the beer I thought I noticed a flavor difference among the fermenters. I had my wife give me a triangle test and could pick the odd-beer-out. One was slightly maltier, but not significantly different. These beers were virtually identical and kept in identical environments, with few factors accounting for the flavor differences. This bolsters similar anecdotal evidence I found in my last split batch. Pitching rates matter. I just wrapped an interview with Meredith Stancik from the local news station. 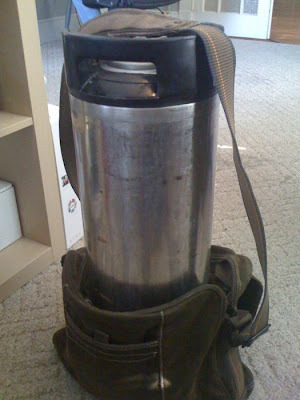 She runs a feature called Saving You Money and this time around is spotlighting homebrewing. I got half a day off work to make some beer for the camera – an experimental one (read about it) – and chat about the hobby. The focus of the piece is how homebrewing is cheaper than store bought beer, which I believe is true. Austin Homebrew Supply, where I buy what I don’t get in bulk elsewhere, sells a basic equipment kit for $80 and about 150 recipe kits that come out to $0.50 a bottle. If you make only one 5 gallon batch of beer it tallies up to around $2.00 a bottle. After three you are down to almost a dollar per cool, refreshing draught. We also talked about my beer consulting work and judging experience. I put in a plug for the homebrew club. The show will air Thursday, September 24th at 10:00pm. I’m curious to see the final product. If possible I’ll get the video up on my blog. Nettle tea helps promote kidney function, reducing the risk for kidney stones and gout. I get attacks of gout when I am not careful what I eat and many of my family members have kidney stones. I do not drink a lot of tea, and rather than changing my habits (putting me dangerously close to sounding old) I thought it more appropriate to get nettles elsewhere. Enter homebrew. The cup of nettle tea I made to get a feel for the flavor tasted vegetal and slightly peppery. Few people, me included, want to drink beer that smells of boiled vegetables. My thinking went to covering it up with a healthy dose of American hops and some big malt. That was yesterday and I didn’t have any Amarillo on hand… or yeast for that matter. The nearest LHBS is a day away by UPS. Because I was being interviewed for a homebrewing segment on the local news there were timing constraints. The beer had to be rolling at 2:30 when the reporter arrived. Not wanting to pay for overnight 10 AM delivery shipping I placed an order and crossed my fingers. Doughed in 2 gallons of 160° F water (mostly RO with some tap water for “minerals”). The mash hit 157° F for 40 minutes. Using an ad-hoc brewing setup I batched sparged through a colander and collected a little more than 3 gallons of 10% brix sweet wort. So far so good. The reporter arrived right on time as the wort was starting to boil. I wasn’t sure how much nettles to add – most of the recipes you find online measure by the fresh bucket or the peck. They went in until I had enough to almost overflow my kettle. By then the wort had a sharp nastiness to it signaling to me that it was a good time to stop. We conducted the interview while the nastiness boiled. Right now I have just about 3 gallons of 13.6% brix wort cooling slowly as I wait for UPS to deliver some Safale US-05 yeast. The slow cool means that the resulting beer will have a lot of DMS, but it is a veggie beer to begin with…. Oh yeah, batch sparging with a colander causes a lot of splashing and hot-side aeration. Maybe my nettle beer won’t start. Looking forward to improving on this recipe with a little more preparation. How Do YOU Decide What To Brew? This post’s inspiration comes from HopWild. It’s audience participation time and the question of the day is this; Where do you find the inspiration for the recipes you brew? Most frequently I make beers “to style”. That is, I pick or design recipes based on historic beer styles. My focus is generally on brews rarely available in my area. The last such beer was a Belgian Triple and the next one will be Düsseldorf Altbier. Researching styles and their individual brewing techniques adds to my enjoyment of the hobby. I page through back issues of BYO and Zummurgy, and read the Classic Style book if it is available. Less often I devise an experimental, outside guidelines batch. My inspiration in these cases comes from an ingredient that I want to spotlight or become more familiar with. The nettle beer is a recent example. Some of these recipes even make it into the brewing rotation. I would like for the nettle beer to become a regular recipe, but after tasting it today it will need much work. Finally, I enjoy making traditional seasonal beers. The only current example of this is a barleywine that has been conditioning since May. I will tap that one on my birthday in late October. I’d like to hear your ideas. Share them in comments (or a blog of your own). On June 20th I made an approximation of a Belgian tripel. 60 minute rest at 152° F. 60 metric minute boil. By the time I was done sparging I had 9 gallons of sweet wort and only enough fermentables for 5 (as planned). To get to my target volume I boiled for three hours. Not much harm in that except the beer will be a good deal darker than it is supposed to be. Came out of the fermenter today nice and clear. Going to be about 10.75% ABV, but you can’t really taste it. Tripels are like that. Another three weeks conditioning in the keg. This beer is delicious. I already have ingredients to make it again. Soon. It’s almost out. Previously I made it without crystal 120, but that malt adds great body and plum/raisin maltiness. While it is full-bodied the beer is not heavy. Traditional British hops give it a earthy, muddied bitterness leading into a spicy rye and Hallertau kick. The finish is peppery, slightly sweet and just a little thick on the tongue. I want more. I really appreciate the ability to do multi-step mashes my new system gives me. For this beer I rested 20 mins at 150° F and 40 mins at 163° F which developed that full body while lending enough fermentables to the wort. The gravity settled at 1.017. As difficult as it is, an extra few weeks conditioning will do wonders. When I tapped it the dried fruit flavors had not developed, however near the end of the keg they come through and really make the beer stellar. I recommend leaving it alone for eight weeks after taking it out of primary. 8 weeks, I thought I waited long enough for this one…. Last September, a day after Hurricane Ike demolished Galveston, I brewed a great rye beer I called Rye of the Hurricane. It was about 20% rye, 5% munich and 75% pale bittered with Mt Hood & Hallertauer hops. The beer came out with a great dry earthy bitterness from the rye and Mt Hood. Five gallons of that beer lasted seven weeks; these day’s I’m lucky to get two weeks out of a keg. Doughed in with 9 gallons of spring water to hit 150° F. Rested 20 minutes. Direct-fire heat to 163° F for another 40 minutes. Sparge with 170° F water to collect 10 gallons sweet wort. Wyeast 1318 London Ale Yeast III; Fermenting at 70° F.
The reason this beer is only 9 gallons is because I changed my strike water volume and forgot to compensate with extra sparge water. I wanted a thin mash – about 2 qts/lb to really pack this beer with malty goodness, but upon getting 11 gallons of strike water in my new mash tun I could see that adding in 23 pounds of grain would possibly overflow the vessel. I should have added the two missing gallons to the sparge to collect 11-ish gallons of sweet wort at completion of the mash. The wort tasted awesome, simply fantastic. 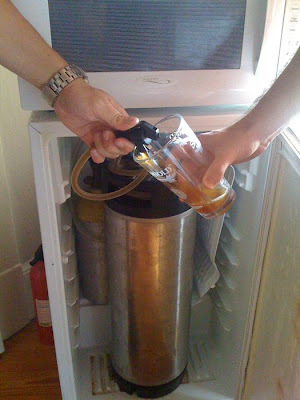 It’s taking all my power not to keg & tap the beer this week – 9 days through fermentation. I hope I have the will to let it sit for another nine days, but I’m out of homebrew at the time. The bitter I made as a yeast starter for Gnarly Barleywine started out “meh” because I tapped it way too early. It became a nice beer near the end of the keg. I will keep that lesson in mind while I drink some commercial beer.